In its efforts towards empowering women and girls, UN Women is working with stakeholders to address several challenges in Africa, including the elimination of harmful cultural practices like early child marriage and Female Genital Mutilation and Cutting (FGM/C). Faith Bwibo (Kenya) serves with the UN Women Regional Office. In this article, she shares her experience as a UN Volunteer in communications. 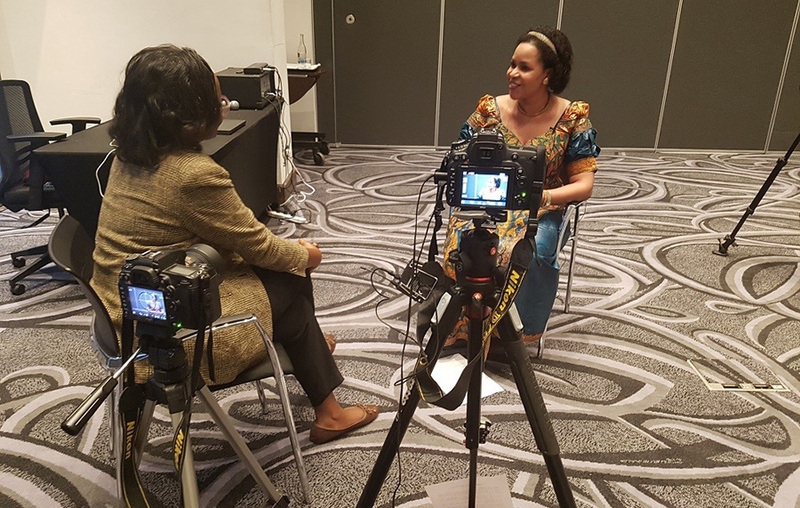 Faith Bwibo, national UN Volunteer with the UN Women Regional Office in Kenya, during an interview with HRH Queen Mother Best Kimigisa of the Tooro Kingdom of Uganda in Nairobi. The implication of various cultural and systemic structures mean that girls and women are negatively affected and do not reach their full potential. Many girls in Africa are married off before the age of 18, many of whom undergo female genital mutilation (FGM), hindering them from finishing their education. Additionally, girls often lack the confidence to pursue their dreams, because they do not believe that they can achieve what their male counterparts can do, including taking up subjects and careers traditionally considered as ‘reserved for boys and men’. Communication and advocacy is crucial in UN Women’s efforts to change behavior and attitudes. While this may take time to realize its impact on the community, its importance cannot be understated. As a national UN Volunteer communications professional, my role entails raising visibility and awareness of the critical work that the UN Women Regional Office does, including providing support to around 13 countries in the East and Southern Africa region. More specifically, I provide communication support for UN Women, including media relations, publicity, social media and website support, trainings, among others - working closely with stakeholders including other UN Agencies, donors, civil society organizations, media, youth among others. My most exciting tasks are creating digital content for the organization and managing the social media and website platforms. As we know, social media is increasingly becoming the biggest platform for instant news and information sharing; and I appreciate that UN Women realizes and appreciates its crucial role. UN Women enables me to use my creativity in my work. I produce content for the UN Women Africa website, including video content and social media messaging. This involves producing multimedia content, conducting interviews, writing stories, photography, among others. I am currently doing a course titled ‘Social media for UN Professionals’ which has further opened my eyes to the power of social media, and how it can be fully exploited. I have been able to use my communication skills to significantly raise the profile of the FGM issues across the continent and build a case for ending the harmful practice. One of my most memorable moments during my assignment was when I interviewed Her Royal Highness Queen Best Kemigisa of the Tooro Kingdom of Western Uganda. She inspired me with her hopes and dreams for the continent, more so in her efforts to ending harmful practices. The other was meeting and interacting with young female coders who were part of the African Girls Can Code Initiative. Through my work, I have been able to curate various messages for diverse audiences. Moving forward, I hope that the communication and advocacy efforts done by UN Women will be fruitful and contribute to the end of all forms of discrimination against women and girls by 2030.